If you’ve been keeping up with my Sonic Colors Road Journal entries, then you are aware of just how much I have been enjoying the game. There isn’t any cheesy dialogue; the levels are designed ever so cleverly; and the game is just a pure translation of Sonic from 2D to 3D. Now let’s take a look at the next two zones in Sonic Colors for the Nintendo Wii. The moment I saw the name of this zone, I immediately remembered Starlight Zone from the first Sonic the Hedgehog. That area was one of the more challenging zones in the game, and it also had some of the most memorable music in the entire series. I thought Starlight Carnival would look more like Starlight Zone, but it was actually really different in appearance from that classic stage. That certainly wasn’t a bad thing, though, because I found Starlight Carnival to feature some of the most impressive visuals in the game. 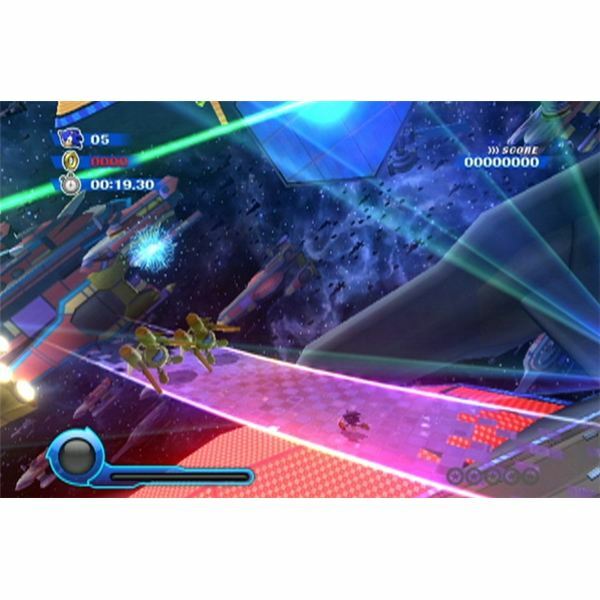 The thousands of stars resting in the night sky; the beautiful lighting effects throughout the entire level; and the rich, colorful path I guided Sonic through all created what can only be called one of the most attractively designed stages in any game on the Wii. This zone featured an insane number of loops, a lot of enemy interaction, and sidestepping gameplay. Baddies constantly fired projectiles at me, and I had to dodge them repeatedly. There were also a lot of enemies on the path, but I unleashed Sonic’s homing attack on them and made short work of the Badniks. Overall, this stage was a bit more difficult than previous areas. It wasn’t anything overly frustrating, but I did meet my demise after tumbling into pitfalls a few times. I welcomed the challenge and stayed more alert as I continued playing. 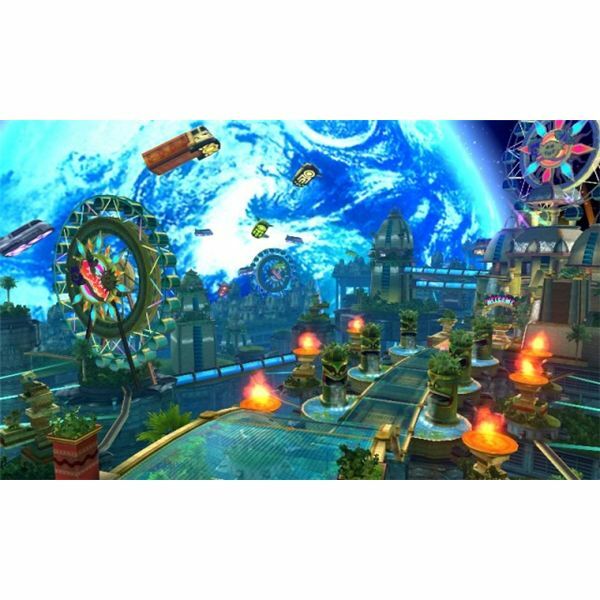 Starlight Carnival was an engaging zone, and one that made me realize one thing: Sonic Colors truly promotes the constant sense of discovery. You can breeze through levels as fast as you wish (granted you don’t fall down a pit) and simply go for the goal. 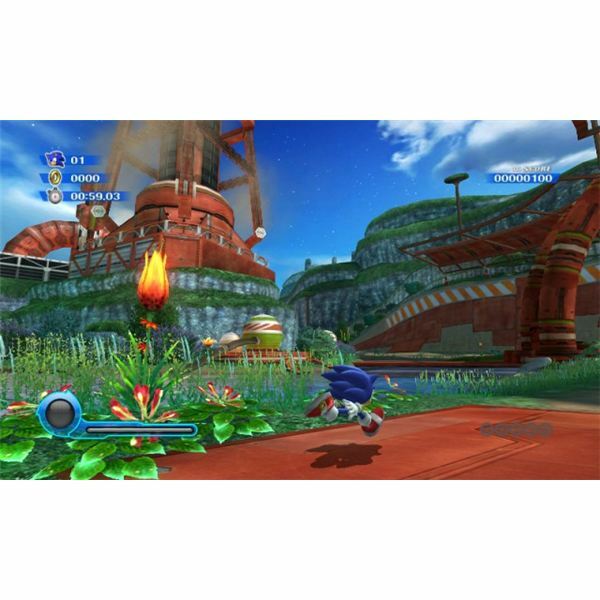 Or you can take things one step further and explore Sonic’s environments. There are plenty of hidden paths and collectible items scattered everywhere, and if you want to take the time to search for everything, you’re still bound to have an enjoyable time playing the game. 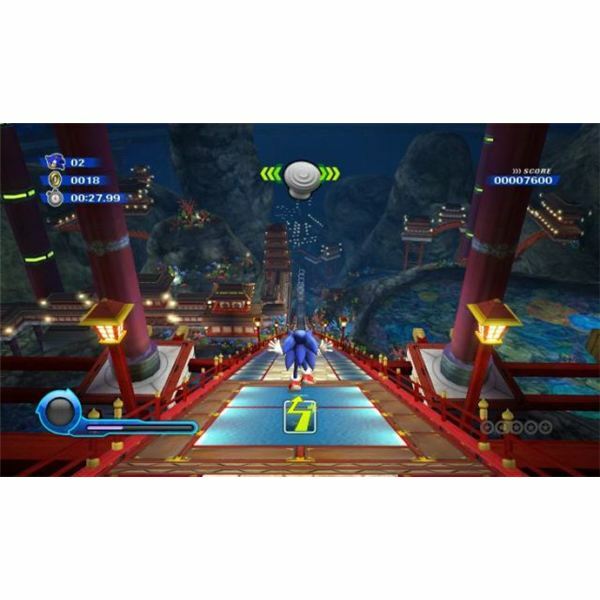 I appreciate the fact that Sonic Colors offers you the option of either racing through levels or exploring the wonderfully themed locales at your own pace. My next stop was Planet Wisp, and upon playing it I was astounded at the beauty of it. Sega really pulled out all the stops here to create one of the most visually stunning games on the Wii. There’s a reason this game is called Sonic Colors. 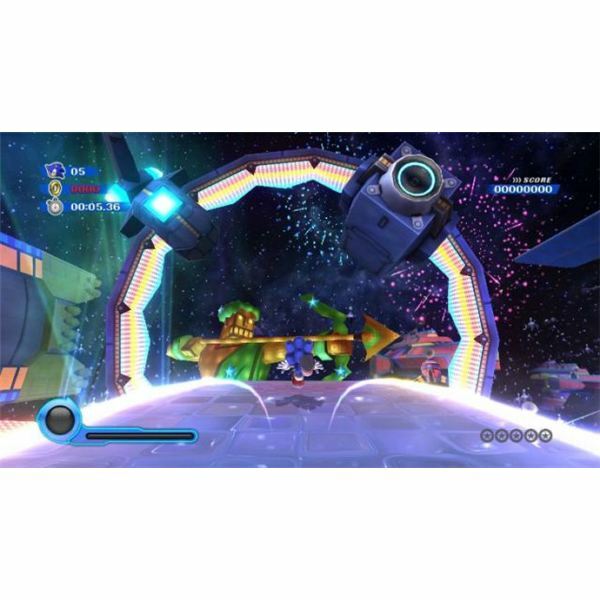 Past Sonic games have had a great deal of charm, but Sonic Colors on the Wii throws in artful aesthetics and some pretty cool visual tricks to provide a breathtaking world. Accompanying the zone’s colorful design was a cheery set of tunes for every level. The music in the game has been catchy thus far, but the music used in Planet Wisp has to be my favorite collection of themes in the game. Somehow the tracks I heard in this zone managed to convey a feeling that times are a-changing for the blue blur, and hopefully for the better. I found Planet Wisp to be the most challenging zone yet. Like Starlight Carnival, it wasn’t a heinously difficult area, but my death count was certainly higher here. I actually managed to see the game over screen a couple of times. Admittedly, I find the fact that this game has continues kind of pointless. You can pause and restart levels as you please, and getting a game over simply puts you back on the world map. Nitpicking aside, the difficulty of Planet Wisp was certainly something I didn’t expect. After all, I pretty much breezed through most of the stages prior to this one, so numerous pitfalls and quick time events caught me a little off guard. That’s not to say the game is easy in a bad way. 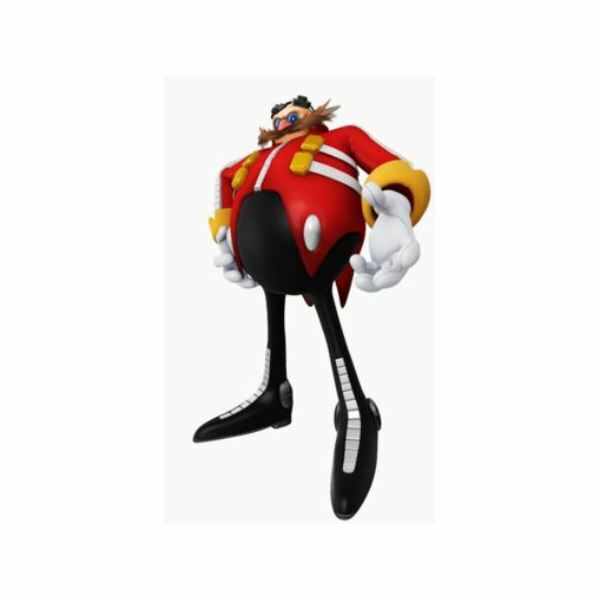 As previously stated, the challenge is there for gamers who want to explore every single nook and cranny in the world of Sonic Colors. Wii owners who played and enjoyed Kirby’s Epic Yarn should know that the ease in Sonic’s latest adventure is similar to that of the pink puffball’s. It’s not a cheap simplicity, but rather one that helps you experience everything that the game has to offer in a seamless manner. I left Starlight Carnival and Planet Wisp with very good impressions. I enjoyed both zones thoroughly, and I look forward to playing them again in the future, both to explore and to get that amazing sense of speed that the game captures so perfectly. For now, though, I set my attention to my adventures in the game’s next zone: Aquarium Park.